The kids are saying yea, no school for a week. But what’s a parent to do when there is more to plan for than a weekend outing? From a tomb and T Rex to penguins and planets, the Museum Campus has lots to keep families fascinated for an entire day. Penguin antics also make visitors chuckle at Lincoln Park Zoo. Lego is a hit at the Museum of Science and Industry and at the Legoland Discovery Center in west suburban Schaumburg. 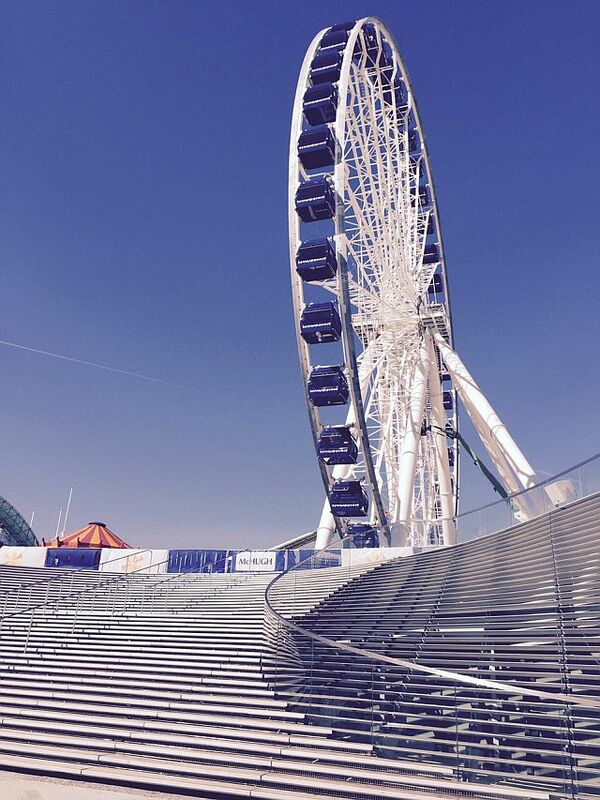 The Centennial Wheel and musical play equipment are awesome at Navy Pier. Check them out and enjoy. Youngsters don’t all like the same things but on Chicago’s Museum Campus at the south east end of the downtown, you can probably satisfy two different interests if you plan carefully. 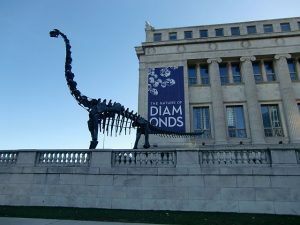 Children fascinated by mummies, dinosaurs and native American tribal life will love the Field Museum while adults will likely want to detour over to its gem exhibit. Anyone who likes penguins or pretty much anything live that moves through water will want to stop at the Shedd Aquarium across from The Field. Budding astronomers and space explorer wannabes will want to go to the Adler Planetarium that’s further down the museum campus’ arm. Families might be able to take in some of two places but really shouldn’t try to do all three museums on the same day. Tip: While on the museum campus walk past the aquarium towards the planetarium .then turn around and look at the city. This is where journalists take photos of the skyline and TV broadcasters go for a super camera op of Chicago’s skyline. Your photo will look like you are out in a boat on Lake Michigan because you are on a peninsula. 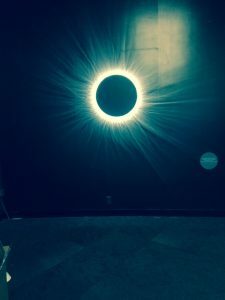 The Museum of Science and Industry south of downtown should satisfy all interests from its coal mine experience, Lego exhibit and futuristic thinking room to Colleen Moore’s Fairy Castle, the Great Train Story’s model railroads and the Mirror Maze. Tip: On April 8 and 9 and April 15, you can also see special Robotics week events. 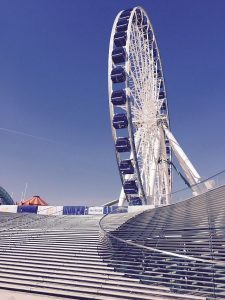 Navy Pier, a 3,300 foot long entertainment pier jutting into Lake Michigan from Illinois Street east of the Mag Mile is home to the Chicago Children’s Museum, a Ferris-type ride called the Centennial Wheel that is almost 200 feet high and ethnic festivals in its Crystal Garden. Tip: There is also an IMAX Theater so check out its film schedule. Plus do ‘Impulse: An Interactive Art Exhibit,’ in the Polk Bros Park at Navy Pier, now through May 21. It’s a light and sound experience where visitors can try out seesaws and other play equipment that produce different tones and colors when activated. Stroll through Lincoln Park Zoo to see two new, polar opposite, animal habitats: South African penguins in their cozy cove (It’s not icy) and Arctic polar bears in a coldly comfortable place. Tip: The zoo and its Lincoln Park environment are fun places to spend a day so plan on eating at Park Place Café which has Mexican, Italian dishes and burgers or if warm enough, the roof top Café at Wild Things above the Wild Things gift store. .
From things to ride, play with and see in 4D to Star Wars episodes to experience, there is an entire Lego world at the Legoland Discovery Center in Schaumburg, Entry and experiences are ticketed so plan ahead because tickets are timed to prevent overcrowding, particularly during winter and spring vacation breaks. Tip: Online tickets save money so check it out at Tickets. From top museums to university programs and volunteer projects there are lots of places to spend time off work or school on Martin Luther King, Jr. Day, Jan. 16, 2017. MLK Day celebrates the birthday of the famed civil rights leader (Jan. 15, 1929-April 4, 1968) on the third Monday of January. It is a federal holiday so most schools and banks are closed and there won’t be any U. S. Postal deliveries. However, Chicago’s museums are open and several are offering free general admission to Illinois residents. In addition, some of them have extended free general admission to other days the third week of January. 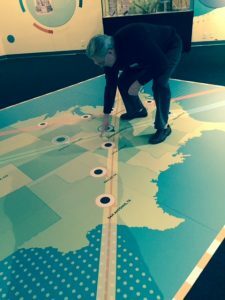 On the Museum Campus, that arm sticking out from Lake Shore Drive in Lake Michigan at 12th Street, look for the Adler Planetarium at the far eastern end at 1300 S. Lake Shore Dr. The Shedd Aquarium sits in the middle of the arm at 1200 S. Lake Shore Drive and The Field Museum is by the entrance to the campus at 1400 S. Lake Shore Drive. The Art Institute of Chicago has free programs in its Ryan Learning Center from 10:30 a.m. to 3 p.m.. They range from performances and stories to art projects. Check out the day’s schedule here. Visitors for these programs enter the Modern Wing entrance at 159 E. Monroe St. to go to the Learning Center. The museum is also free all day for Illinois Residents. Main entrance is at 111 S. Michigan Ave., Chicago. Several suburbs have volunteer projects taking place on MLK Day. Check your suburb. On the North Shore, Highland Park has invited Illinois Secretary of State Jess White who was a student of Dr. King, and the Jesse White Tumblers to appear. In addition, the town has several service projects. The Recreation Center of Highland Park is the headquarters for the events. They run from 10 a.m. to 2 p.m. See HP for details. The Village of Deerfield is collecting supplies for the homeless and has organized service projects. The Deerfield Village Hall is headquarters for a Day of Service from 1 p.m. to 3 p.m. For details click Deerfield. A play by Allie Woodson about what it means to be young, gifted and black is performed Jan. 13 at 7:30pm and Jan. 14 at 2and 7:30 p.m. at Shanley Pavilion, 2031 Sheridan Rd. “Social Movements for Racial Justice: From the Chicago Freedom Movement to Black Lives Matter” is Jan. 21, 10 a.m. in Fisk Hall 217, 1845 Sheridan Rd. The program is an intergenerational presentation and discussion about racial justice movements in Chicago over the last 50 years. Authors of the book The Chicago Freedom Movement: Martin Luther King and Civil Rights Activism in the North will share personal experiences marching with Dr. King..
NASA astronaut Mae Jamison, a member of the National Academy of Sciences’ Institute of Medicine, gives a keynote address Jan. 23, at 6 p.m.p.m. in the Pick-Staiger Concert Hall, 50 Arts Circle Drive. NASA astronaut Mae Jamison will speak Jan. at noon at the Hughes Auditorium, 303 E. Superior St.